We developed a unique (homemade) noodle that compliments the soup. Our establishment, the Aoyama Group, currently runs nine eatery branches. From the beginning of our 1st branch opening, we have been using homemade noodles, and currently run a noodle-production factory to supply the locations. In addition to our eatery branches, the noodles are sold wholesale to other ramen eateries in Chiba prefecture as well as golf courses. 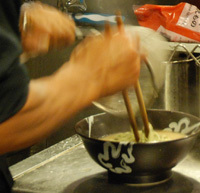 In order to give each branch location a concept, we differentiate and adjust the soup, noodles, and spices. The quality that remains constant for the whole Aoyama Group noodles is that, the conventional 2% saltwater content was dropped to 1% to diminish the typical ammonium smell, and uses Mongolian saltwater which doesn’t have any idiosyncrasy. The fact that our noodles are slightly whiter due to lower saltwater content is the distinctive trait of the noodles made by our company. 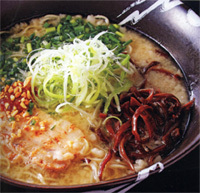 The concept for the “Minami-Aoyama” branch is Hakata (Kyushu) style ramen- with boiled-pork-ribs. With the standard ramen as the principle dish, our menu also has a variety of other noodles such as “tsuke-soba”, our original “tan-tan-soba,” and our popular “Dotechin” menu all of which use “tonkotsu” pork stock as the soup base. The Aoyama Group currently makes four different types of noodles, and our regular menu has one to two types. The medium thick noodles are assigned to the miso ramen, which is served with the soup made blending several different types of miso. The noodle is made with pure saltwater, and has a chewy “mochi-like” texture. 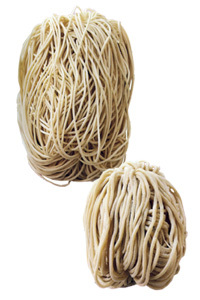 The main noodles are the noodles used for ramen and the tan-tan soba, which have production rate of hundred servings per day. Based on the thickness of the pork stock and its balance to the noodles, it was decided that the noodles should have 28% salt water content. We aspired to making noodles with a bite, which is distinct to Hakata-style-tonkotsu ramen noodles. In order to create these noodles, we used protein and ash, in affect producing a distinct “koshi” with mellowness to the aroma. The greatness of making homemade noodles is that one can use the noodles that satisfy one’s expectations. With this ability, we continue to produce noodles every day that satisfy beyond our customers: expectations. Noodles are set at the noodle-production factory for one day, and those that are ready are immediately brought to the branches. Flour used for the noodles. At our establishment, in order to bring out the natural taste and the distinct flavors of the flour, we do not blend it with non-pure ingredients. For the flour itself, we only add water and salt, the principle ingredients itself. We use two noodle machines, allow the noodles to set for one day, then noodles which are ready are sent immediately to the various branches. We do not use any preservatives, as we only use noodles up to two days after delivery. The humidity of the production space is always set to 30-40%, as we produce carefully and meticulously. At the Aoyama Group, the final number of choices on the various menus is incredibly large because each branch has its own distinct menu. Other than the main branch, the managers create the menu for their own branch. As shown in the image the noodles are made so that it facilitates the process, which also ties into safety. The final dish can be made exactly as one imagined. Part of our meticulousness depends on the safety of those that make the dish. And part has to do with safety of our customers. This is why we do not use preservatives. Our services also extend to consulting for starting up independent businesses. Even if the start-up business is a part of your home, our company can help you create a layout of the kitchen / cooking area, and the right ventilation system. In addition, we can connect you with the right contractor based on our company knowledge from various experiences. Our company is dedicated to helping you create a business aligned with your vision. We can help design a business that is specific to the location, and the specific tastes of the clientele. The company can also help provide support for your ideas, if you are aspiring to create an eatery overseas. Our company can provide you with the basic training from management, to reception, to register. After the opening of your business, our supervisor can visit periodically to give you support with your business. Copyright© 2019 麺屋青山 All Rights Reserved.